NEW! BARE KNUCKLE BOXING (BKB) IS BACK! On December 7th, BKB makes its much anticipated return. When it does, DIRECTV for BUSINESS™ customers will receive exclusive access for the low price of just $99! BKB2 builds upon the extremely successful BKB1 event, which featured faster rounds, bigger knockouts, and a ring design that gives fighters nowhere to run! 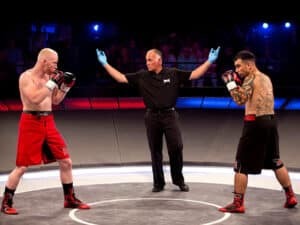 The action will only get more intense for BKB2 which will include 7 fights on Pay Per View, including 2 title fights for the middleweight and lightweight belts. BKB has taken the world by storm and will be the next big sport for fight fans! You are going to be knocked out by all the action and excitement BKB2 will bring to your business. So be sure to let your customers know you will be showing about this exclusive event that can only be seen on DIRECTV! Customers will be receiving BKB2 communication through various channels. To order this exclusive event, call 888-728-6036. For more information about BKB for your Business call 888-728-6036 or contact Its All About Satellites.